March 1, 2016 March 31, 2018 - by Gold Cochin - 24 Comments. 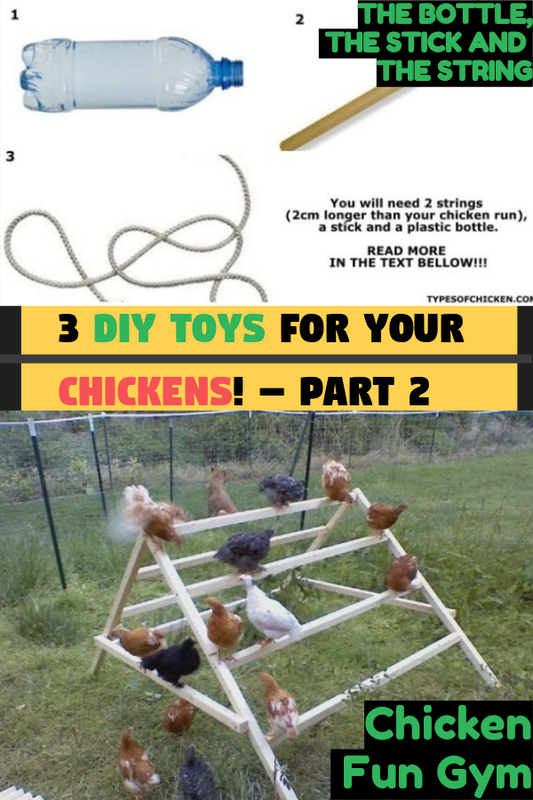 Some time ago we at the typesofchicken.com team gave you an article on How to keep your chickens entertained and 3 DIY toys and from your feedback, we came to the conclusion that you might want more. We discussed what chickens do when they are bored so now we will skip that part and go directly to the toys. Without further ado, here are the new DIY toys for your chickens brought to you by the typesofchicken.com team. This is one of those toys for your chicken that can be fun to make and it gives you a lot of room for creativity. You will need some leftover woods, some nails, and a hammer. It takes around an hour and a half to build. 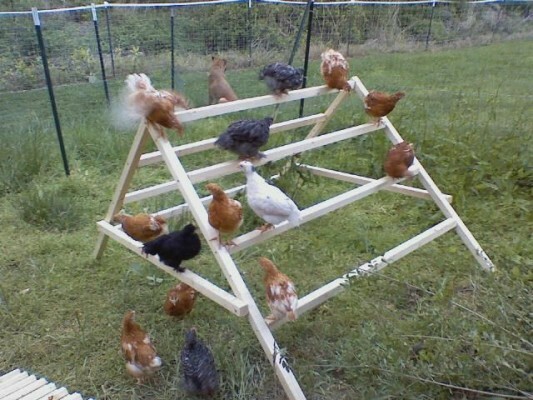 Based on observation of your chickens and how they like to play you can build them a playing toy like an A-shaped ladder. Take the required measurements (based on the size of the place for playing your chickens have) and make it wider than a regular A-shaped ladder. Except for the bottom step of the A-shaped ladder (which from now we will refer to as the chicken fun gym) make some holes in the other steps and make those holes big enough so you can put some small treats in there. The wider the steps of the chicken fun gym the more room for holes you will have. When the chicken fun gym is made and ready to use, remember to put some treats in those holes and watch the chicken jump from one step to the next to get to those treats. We at the typesofchicken.com team used the A-shaped ladder idea to make our chicken fun gym, if you don’t have enough wood or means to build this – feel free to get creative and build your own chicken fun gym and don’t forget to share it with us. This toy is one of the funniest to watch chickens play with, and it does not require a lot of effort to build. 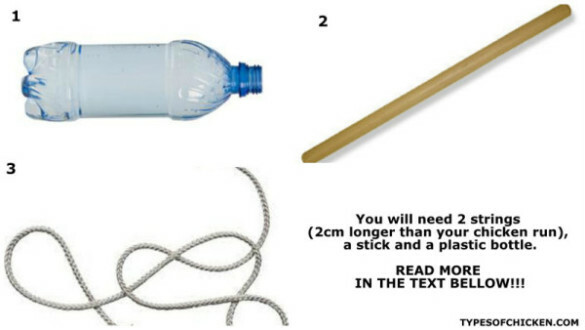 You will need 2 strings (2cm longer than your chicken run), a stick and a plastic bottle. First, you need to make 2 holes on each side of the stick so each string can pass through. 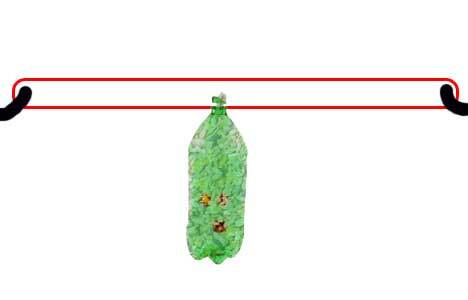 Take the plastic bottle and lay it on its side, on the top side make one big hole from each side so the sick can fit (make sure the stick is 5 or 10 cm longer than the bottle), and on the bottom side of the bottle make more holes so the chicken can peck at them. Connect the strings on one end of your chicken run as high as your chickens are, then put one string through each end of the stick (make sure that you already placed the stick and the bottle together and that you have put the treats in the bottle). Once the strings are put through the stick and the stick is put through the bottle connect the strings at the other side of your chicken run – as tight as possible. The outcome of this toy is the harder the chickens’ peck at the bottle, the further away the bottle goes. This is very fun to watch especially when you have chickens on each side of the bottle and they are throwing it to each other. 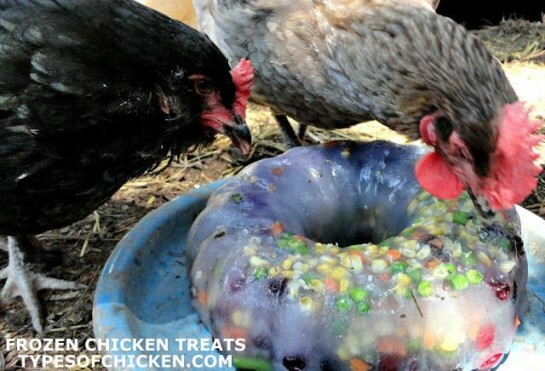 This is not exactly a toy for your chickens but it is a good pass time and a method for them to cool off in the hot summer and that is why we at the typesofchicken.com team decided to share it with our readers in this article. Freeze some treats in a larger block of ice, and when your chickens are ready for their hot summer day run, present it to them. They will peck at the ice until they get to the treats. This will make your chickens safely waste their extra energy in the hot summer days. Previous Article PROS & CONS of Keeping Silkie Chickens! Next Article 10 Simple Games and Activities For Your chickens! Would love to see a pic of the “bottle, stick and string” toy in use. Its hard to visualize from the description. I agree. Can’t quite get the concept. Think I’ll give this one a miss before I turn myself inside out trying to work it out. I agree with Jena. I am not able to visualize “the bottle, stick and string” based on the description given. The toy works on a similar principle as a cable car, the string presents the cable and the stick and the bottle present the car. When the chickens are pecking they are basically moving the cable car. We apologize for not providing a picture. I still do t understand.. Where does the stick go? The stick goes sideways of the bottle. Just punch a hole through the bottle and slide a stick in, make sure the holes are not too tight. Then tie a piece of sting to each end of the stick (2 strings) then hang it up. Yes, ditto to the all above commetns. Does the stick stick out sideway of the bottle? Yes, the stick goes sideways. Sorry still not getting stick, bottle, string. Please a picture. You have you start by looking at the bottle and determining that you are NOT going to cut ant hole down the centerline of the bottle. Mentally cut the in two pieces and then on one half are you making a letter “T” with the stick and the bottle? But if you do that, the string would be like a bow string. Then the ‘bow string’ could/would be perpendicular to the chicken run string. The on the other half of the bottle, the very bottom edge is where the holes for the chickens are supposed to be made? No suggestion as to size, but I suppose large enough to encourage their beak but small enough to keep the treats relatively whole, for a while. How about 1/8 inch hole? I still don’t get how it goes up and down the line if it’s built this way. Maybe I’m way off. I get the bottle! Similar to what Kelly is saying.. The stick is going through the top half of the bottle, to form a “T”. Then, this stick-in-bottle contraption hangs from the first string that is tied length-wise in the run (because the second string is tied to either end of the stick, making a type of bow). Feeling dumb as a wet bag of cement, now. Still can’t visualise this. Can someone post a sketch, please, if not a photo? (does this site bar images?) If not, is there a picture somewhere else on the web you can point me to (this is if this site doesn’t bar links)? I thought I got it after Laurel’s post, but then she says it is a type of bow, and that just makes me more confused, as what I’m imagining isn’t like a bow at all. I see your concern but I’ve hung veg for 11 years and no accident had occurred! trust me, they are way too smart to get knocked out by it swinging around! sometimes, if I have no cabbage, I will take a handful of greens (lettuce, kale, dandelion, whatever) and wrap slices of bread around them, and stuff that in…I have also hung bagels from string…all work! Would you have to have it on a pulley? Yes, that’s how I imagine it! I had originally visualized my bottle being horizontal but I couldn’t figure out how to keep it that way, or even make it work. Your picture is great, it is a big help. I think that where you have the stick through the bottle’s neck might cause problems with refilling of treats. I think that I will put my stick through farther down the bottle, closer to where the ‘shoulders’ start. I’ll need to make sure that my string going through the ends of this stick is long enough to go over the end of the bottle cap plus maybe an inch or two of extra length. If the chickens get this toy to moving with any speed, the extra length could provide dangle room for the top of the bottle to sway a little more wildly? P.S. I hope I caught all my typos this time, and apologies for all those I missed last time. Does anyone have measurements for the Chicken Fun Gym?